Expanded Sheet Metal, available in aluminum, stainless, steel expanded metal, and wire mesh, is slit and stretched to create diamond shaped perforation. It can be customized to create diamond openings of a specific size. Aluminum Expanded Metal is a corrosive resistant sheet product that has been slit and stretched to form several styles of diamond shaped openings. These lightweight sheets have diamond openings that allow light, liquid, sound, air to pass. It is frequently used for flooring, walkways, security cages, machine guards, or decorative ornamentation. These sheets are available in stock sizing and can be custom cut. Shop for Aluminum Expanded Metal Online! Stainless Steel Expanded Metal is a corrosive resistant sheet product that is slit and stretched to form diamond shaped openings that allow liquid, sound and air to pass through. It is frequently used for flooring, walkways, security cages, machine guards, or decorative ornamentation. These sheets are available in stock sizing and can be custom cut. Shop for Stainless Expanded Metal Online! Steel Expanded Metal, slit to create diamond-shaped openings that allow liquid, sound, and air to pass through. It is frequently used for flooring, walkways, security cages, machine guards or decorative ornamentation. These sheets are available in stock sizing and can be custom cut. Shop for Steel Expanded Metal Online! 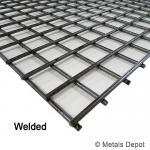 Welded Steel Wire Mesh is a grid formed by welding steel wire together at their intersections. Stronger than Woven Steel Wire Mesh, it is stable, strong, attractive, and versatile. It is available in a range of wire diameters and opening sizes. It can be purchased in stock or custom sizes. Woven Steel Wire Mesh is formed by weaving and crimping wires at their intersections. It is rigid, stable, and attractive. It is available in a range of wire diameters and opening sizes and can be purchased in stock or custom sizes. 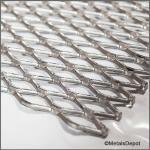 Shop for Steel Wire Mesh - Welded & Woven Online!